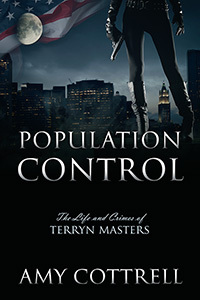 There’s a mystery at every turn as Terryn Masters digs through the pieces of her old and new lives in Population Control. When Terryn is offered a job at The Agency, she is hungry, cold, and living on the streets. The secret government agency promises her a new life, and indeed, everything appears to be falling into place for this former foster child as she finally finds friends, a handsome fiancé, and the most stable life she’s ever known. But she is quickly reminded that things are not always what they seem when they begin to unravel all around her, and Terryn is forced to fight to save her own life…and the lives of everyone she cares about. Amy Cottrell is from Lubbock, Texas. The mother of four, Amy is a former newspaper columnist and marketing consultant. Population Control is her debut novel.